A detailed shirataki noodles recipe that will teach you how to make the most out of these zero carb noodles. Simply buttered, they are delicious! This easy shirataki noodles recipe is so good. When cooked properly and buttered, these noodles are very tasty! How are shirataki noodles zero calories? Shirataki are traditional Japanese noodles made from the high-fiber konjac root. They are basically made of fiber and water. So they have no nutritional value. They have no calories and no net carbs, despite being very filling. Which means that they are keto, low carb, and low calorie. Yes and no. They have no flavor of their own, which makes them an ideal vehicle for absorbing soups and sauces. I find that they make a good pasta and noodle substitute. That is, as long as you prepare them correctly (instructions below). Otherwise, they are rubbery, slimy and unpleasant to eat. Don’t be deterred by their fishy smell when you open the bag! After you rinse them and pan fry them in a dry pan, that smell will go away. 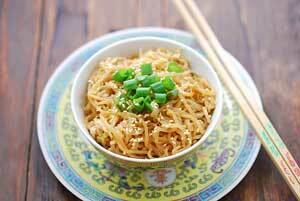 You do need to prepare them correctly according to a good shirataki noodles recipe. Then mix them with a yummy sauce, or add them to a soup. When you do, they definitely give a satisfactory answer to your noodle cravings. That is if you happen to have them. I know I do! Having said that, do not expect this shirataki noodles recipe to taste like regular pasta! That would simply be impossible. You should view it as a good substitute for anyone on a low carb or a low-calorie diet. But it’s not the real thing. They do seem to have health benefits. Konjac root is basically glucomannan, a soluble fiber, or prebiotic. It encourages the growth of good bacteria in the stomach. Having said that, it CAN cause intestinal distress in some people. So start slowly and see how it affects you. If you suffer gas or stomach ache, shirataki noodles are sadly not for you. I wish I could have a definitive answer. But I honestly never had to deal with leftovers. I never have leftovers when making this shirataki noodles recipe. 😀 But I assume that you can keep leftovers in a sealed container in the fridge for 3-4 days and reheat them in the microwave on 50% power. Can you recommend more shirataki recipes? Sure! Here’s a link to more shirataki recipes. Many of them are Asian inspired, which is no surprise. I also like to simply add them to homemade chicken broth or bone broth, to make it more filling. But my favorite recipe is the simplest – buttered shirataki noodles with Parmesan. Here’s how to make it. Bring a medium pot of water to a boil. Measure out your butter and Parmesan, and mix the salt, black pepper and garlic powder in a small bowl. Using scissors, open the shirataki noodles package. Pour its contents into a colander. Ignore the slightly fishy smell - it will rinse/cook out. Rinse the noodles under cold running water for a full minute. Use clean kitchen scissors to cut the noodles in half - they are too long to eat as they are. By now, your water should be boiling. Transfer the noodles to the boiling water, bring back to a boil and boil for 3 minutes. While the noodles boil, heat a clean, dry medium-sized skillet over medium-high heat. Pour the cooked noodles back into the colander and drain well. Transfer the noodles to the hot skillet and dry-roast them (adding no oil to the skillet), stirring, for 1-2 minutes, until they are visibly dry and make a squeaking sound when moved in the skillet. This step will get rid of the shirataki's rubbery texture, and help them better absorb the sauce compared to when slippery and wet. Add the butter to the skillet. Thoroughly mix it into the shirataki noodles, coating the noodles evenly. The noodles look much better now - they started out translucent-white and slimy; turned into a more opaque white after dry-roasted; and now, covered in butter, they are golden and smell really good. Add the salt, pepper and garlic powder, mixing them evenly into the noodles. Turn the heat off, and mix in the Parmesan. Serve immediately. Shirataki noodles are not for everyone. In some, they may cause bloating, gas, diarrhea or constipation, and even intestinal obstruction. They can also affect the metabolism of medications.